As always, I am playing with fire when I critique Warren Buffett, but he does indulge in hyperbole (I hope that is all it is..) when he strays from his preferred habitat. In fact, my previous post on him evoked some strong responses. In the last Berkshire Hathaway report, he is quoted as saying “Both Charlie and I believe that Black-Scholes produces wildly inappropriate values when applied to long-dated options… Academics’ current practice of teaching Black-Scholes as revealed truth needs re-examination. For that matter, so does the academic’s inclination to dwell on the valuation of options. You can be highly successful as an investor without having the slightest ability to value an option”. a. "Both Charlie and I": I presume that Charlie here stands for Charlie Munger, the other fount of wisdom from Omaha. I guess this is supposed to add to the intimidation factor. If Charlie Munger agrees with Warren Buffett, what right-minded person would disagree, right? Charlie Munger has a way with words (I especially love this quote: "If the only tool you have is a hammer, everything starts to look like a nail.") But so do Yogi Berra and Lady Gaga, and I am not listening to investment advice from either one..
i. How would Mr. Buffett know that they are wildly inappropriate? Because the values he got from these options were higher than Mr. Buffett's gut said that they should be worth? Perhaps, he should take a look at LEAPs (long term call and put options) traded on US stocks on the exchanges. As the value guru, he may think that all of these options are being over valued. If so, I would welcome his intervention in these markets. ii. What exactly did Mr. Buffett do with the Black-Scholes model? The Black-Scholes model is only as good as its inputs. With long term options, the variance that should be used in the model is a long term variance (which may be well below the current level) and if the options are management options, you should be correcting for dilution and illiquidity. Since FASB has required companies to value management options and expense them for the last three years, this is a well researched area of finance. With the adjustments, the Black Scholes delivers reasonable values for options. c. "Academic’s inclination to dwell on the valuation of options": I love this one! Where does Warren Buffett's academic live? Is he a Phd student that Buffett and Munger trapped in the 1970s and put in a hut in Omaha, poring over old Journals of Finance (preferably from the 1960s)? That may explain Buffett's fixation with the CAPM and the Black Scholes. There are some academics and many practitioners who dwell on the valuation of options, but there is a reason for that. It is their job is to assess the value of listed options, warrants or convertibles, and if that is their job, they have to just dwell on the valuation of options. I am an academic (in Buffett's sense of the word) but option valuation is an after thought to me, not a central part of either corporate finance and valuation..
d. "Academics’ current practice of teaching Black-Scholes as revealed truth needs re-examination: I would be interested in what constitutes "current" practice to Mr. Munger and Mr. Buffett. Furthermore, what are these nasty academics doing? Are they telling their students to value options using the Black-Scholes model, to buy under valued options and sell over valued options? e. "You can be highly successful as an investor without having the slightest ability to value an option": Here is the only statement that I completely agree with. Absolutely, but only if you stay away from option laden investments (which includes companies like Cisco which have a significant management option overhang, oil companies with undeveloped reserves like Petrobras, pharmaceutical companies with potential blockbuster drugs making their way through the pipeline). I am sorry if you find me to be disrespectful for not treating Warren Buffett as a minor deity, whose every word is gospel. It is clear that all of the praise that he receives from his followers has gone to his head. He sound absurd when he talks about derivatives and seems to think that he is a macro forecaster (which actually cuts against everything he stood for two decades ago). I will pay him the ultimate compliment (or insult) by taking every macro suggestion that he makes and doing the opposite. As many of you who have been readers of my posts know, I have a bit of fixation on the equity risk premium and have had several posts on the topic. The equity risk premium is what investors charge over and above what they can make on a riskfree investment to invest in equities, as a class. The reason for the fixation is simple. The equity risk premium is a central number in both corporate finance and valuation. In corporate finance, it determines the costs of equity and capital for firms, and by extension, their investment policies. It also drives the choice between debt and equity and determines whether the company should be accumulating cash or returning it to stockholders. In valuation, it is a key input to the value of any company. The message that I have tried to deliver is that this number is too important to be be viewed as a constant or outsourced to someone else. Thus, the defense that is offered by many investment banks, consulting firms and corporations that the equity risk premium that they use comes from a reputable source (Ibbotson, Duff and Phelps or Credit Suisse) fails the credibility test. If you run a business or have to value it, you have to take ownership of this number. A confession, though, is a good place to start this discussion. I used to think that equity risk premiums in developed markets were fairly stable numbers and that mean reversion (assuming that things move back to a normal or at least average level) was a safe assumption. That is.. until September 2008. I got a wake-up call between September 2008 and December 2008 about the dangers in this assumption as equity risk premiums in developed markets exploded.. by my estimate, the equity risk premium in the S&P 500 almost doubled in two months. I wrote a paper on equity risk premiums in the midst of that crisis in November 2008 and the response indicated that quite a few other people were just as concerned as I was about the lack of attention that practitioners paid to what the equity risk premium was and what it was measuring. It is awfully an long paper (about 94 pages) and I apologize in advance. Some of the verbosity can be attributed to verbal diarrhea, an occupational hazard for someone who loves writing and likes hearing himself talk. Some of the length, though, is due to the fact that this is a widely researched topic, examined from many different angles, and I felt the urge to present a full picture. 1. The equity risk premium is neither a mathematical number nor is it a statistical number. Instead, it is a reflection of what investors are feeling in their gut: if investors feel more worried about the future, the equity risk premium will rise. After the last week (Feb 20-24, 2011) in the Middle East (Egypt in turmoil, Libya on the edge, the House of Saud wondering whether the bells will be tolling for them), equity risk premiums have probably risen across the globe. a. You can survey investors, portfolio managers, CFOs or even academics to get a sense of what they think is a reasonable value for the equity risk premium. As I note in the paper, these survey premiums right now indicate that people seem pretty sanguine about equity risk and the risk premiums have dropped from what they were two years ago. The actual values range from just above 3% (from CFOs) to just under 4% (portfolio managers). b. You can look at the past and look at the actual premiums earned by stocks over riskless investments in the past. I do this as well, using the long historical database that we have in the US, and estimate that stocks have earned an average premium of 4.31% over treasury bonds between 1928 and 2010. That is very close to the 4.29% that I reported as the historical premium last year, using 1928-2009 data. However, there are two caveats. Even with this long time period, the standard error in the estimate is 2.38%; applying the standard plus or minus two standard errors to the 4.31%, we would conclude that the true risk premium can be zero or greater than 9%. Second, the historical premium number itself can change depending upon your choice of riskfree rate (T.Bills or T.Bonds), time period (1928-2010, 1960-2010, 2001-2010) and averaging approach (arithmetic average or geometric average). Needless to say, I don't trust historical risk premiums. Those of you who follow me on Twitter (#AswathDamodaran) get my monthly updates on the equity risk premium, at least for the US. d. Estimating equity risk premiums in emerging markets is more difficult to do, partly because the historical data is thinner and less reliable. Implied premiums are more difficult to estimate because of the absence of information on cash flows and growth rates. Notwithstanding these limitations, I have laid out three ways in which equity risk premiums can be estimated in emerging markets and my biases about these approaches. Looking at the big picture, though, it is astonishing how much equity risk premiums in "big" emerging markets (India, China, Brazil) have declined over the last decade, a huge contributor to the surge in equity prices in those markets. e. Risk premiums for the most part move together across different markets, geographically and across asset classes. As the equity risk premium has changed in the US, so have the default spreads on bonds and risk premiums in real estate. When risk premiums do not move together, all too often it is an indication of a bubble in one market or a mispricing in the other. a. If your job is to be market neutral, i.e., assess the value of a company, given where the market is today, you should use today's implied equity risk premium. On February 24, 2011, this would have meant using 4.98% in a mature equity maret. Using any other premium would introduce your market views into the valuation. b. If you are a long term value investor and don't have to answer to market metrics in the short term, you are lucky. You can then take market views into your valuation by using what you think is a better long term estimate of the equity risk premium. c. If you are a CFO and are concerned about long term value, you can take the same point of view as the long term value investor and estimate a "normalized" equity risk premium. d. If you are a macro strategist, you can look at implied equity risk premiums in different market to make your judgment on where you want to invest your money. As a general rule, you want more of your money invested in markets with high "risk premiums" and less invested in markets with 'low" risk premiums. We have an interesting long-term experiment in the making in the pharmaceutical business, as two of the largest players - Pfizer and Merck announced their plans for the future. Pfizer was the first up, announcing its plans to buy back stock and rein in R&D. Pfizer has been an active acquirer over the last few years, buying Wyeth for $68 billion in 2009, and this announcement seems to at least implicitly suggest at least a pause in, and perhaps an abandonment of, that strategy. Merck responded with a very different vision of its future, suggesting that it would be investing more in R&D and would not be returning cash (at least in the near term). Given that Merck spent $41 billion buying Schering Plough in 2009 and is still showing signs of indigestion from that acquisition, it is not clear whether this announcement is an indication that they have abandoned the "big acquisition" strategy for a return to basics. 1. Is investing in R&D and capital investments the patriotic thing to do? Pushing companies to invest their cash, whether it be in R&D or in factories, is not always good for the economy and using patriotism as the argument for doing so strikes me as wrong on three levels. The very fact that you have to use the patriotism card suggests to me that you have lost the economic argument. (It is akin to the "strategic" card that some managers pull when they want to push through an investment or acquisition that makes no economic sense.) Through the centuries, political leaders have called on their people to give up economic and political rights in the cause of the "greater good ". There are times where the argument reverberates. FDR and Churchill's pleas for shared sacrifice during the Second World War were responded to, because people (and by extension, corporations) recognized that losing the war would catastrophic to their own interests. And you cannot attribute the success to the persuasive powers of the leaders. After all, Winston Churchill lost his prime ministership and the British parliament in 1945, when the fear of war passed. In most periods, though, the argument falls flat because people detect the emptiness behind the sloganeering. Is it patriotic for companies to build factories and invest in R&D, if the economic rationale for doing so is not there? Sure, if you define short term job creation as patriotic. After that initial glow, though, how do you sustain these uneconomic investments? You either provide taxpayer subsidies in perpetuity or the investments shut down: the former are not tenable with our budget deficits and with the latter, the layoffs return with a vengeance as the investment craters. Even if you believe that it is appropriate to draw on patriotism as a rationale for economic decisions, it is one thing to ask it of individuals and another of corporations. A corporation is a legal entity, owned by stockholders. With globalization, the investors in many publicly traded US companies are Europeans, Asians and Latin Americans, just as investors in many companies in those countries are US citizens. Why should a Brazilian stockholder in Merck or Pfizer have to pay an economic price for either company to do its patriotic duty and invest in US jobs? Bottom line: If you want to induce companies to invest their money, try to create an economic environment where such investments make sense. That does not mean creating special tax breaks for these investments (that is just another way of taxpayers subsidizing bad investments). It would imply reducing macroeconomic uncertainty and putting place policies that increase overall growth. If in spite of all these efforts, investments still don't make sufficient returns, the most patriotic thing for companies to do is to not invest the money but instead to give cash back to stockholders who will find better places to invest. 2. What does the market reaction to these announcements tell us? I am always leery about reading too much into how the market reacts to individual firm announcements. After all, we have a sample of two in this case. But I can predict the two polar opposite reactions that the Merck/Pfizer news story will elicit. At one extreme will be those who belong to the "don't trust markets because they are short term" group. To them, the fact that market reacted negatively to Merck, a firm belonging virtuously (any firm that invests in R&D is endowed with this label) and positively to Pfizer, a firm catering to the greediest among us (since only greedy investors want to cash out on investments) will be viewed as proof that markets are short term and not to be trusted. I would have more sympathy for their arguments if the market reaction was knee jerk, always negative for R&D (or other investment announcements) and always positive for stock buybacks. But that is not what the evidence indicates. 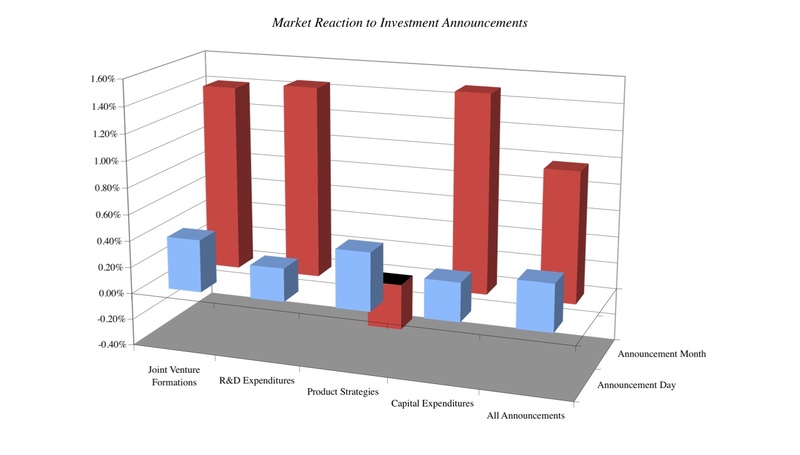 On average, stock markets react positively to investment announcements, whether they be in R&D or more conventional capital expenditures, as evidenced by the figure below. However, this chart is not a blanket endorsement of R&D or investment being good. In fact, stock prices go down at some firms that announce investment plans, as they did at Merck. Is the market being unfair to Merck by reacting so negatively to the announcement that it would increase R&D? I don't think so and Merck's recent history is one reason that the market is skeptical. The firm has invested tens of billions in R&D over the last 20 years but they have not much commercial success to show for the investment. More significantly, they did spend $41 billion to buy Schering Plough just two years ago, an action that makes little sense if Merck felt confidence in their internal R&D's value creating ability. Finally, investors are also aware that the health care business is changing in fundamental ways and many of these changes will not be friendly to the bottom line at pharmaceutical companies. At the other, there will be firm believers in market efficiency who will point to the market reaction as evidence of the foresight and wisdom of markets. I am not willing to go that far, based on the limited evidence. After all, there are investors who react to every stock buyback as good news, at least initially. 3. Which of these firms took the "right" action? a. Market follow through: Investors get a chance to reassess their initial reaction as markets settle down and fundamentals reassert their dominance. If six months from now, Pfizer has been able to sustain its gains, I will feel more confident that it did the right thing to begin with. Conversely, if six months from now, Merck's stock price has reversed direction and risen, I will be less worried about the R&D being misspent. c. Internal consistency: Perhaps, the worst thing that either firm can do now is take other actions that are inconsistent with their current actions, in terms of future direction. With Pfizer, these inconsistent actions would take the form of expensive acquisitions and new stock issues to fund these acquisitions, actions that don't jell with more frugal, mature, cash returning company it is portraying itself to be. With Merck too, a return to large acquisitions would contradict the return to R&D roots story that they are pushing. This is the fourth of a series of posts that I have on dividend policy, starting with the one noting the shift from dividends to stock buybacks, moving on to examining whether buybacks are good news for stockholders and then looking at the consequences for investment strategies of the shift. In this post, I would like to examine how companies should think about dividends in a globalized economy, with relatively few safe havens. The best way to describe dividend policy at most US and European companies is that dividends are sticky. Put differently, the dividend per share this year at most companies will be set at either last year's level or will be a little bit more. Cutting dividends is viewed as an action of last resort, when all else has been tried and failed. If you combine the reluctance to cut dividends with their stickiness, it is no wonder that dividend changes lag earnings changes. In fact, a study, by John Lintner in 1956, of how US companies set dividends came to almost exactly the same conclusions, showing how little dividend policy has changed over the decades. This policy, in turn, can be traced back to the origins of stock markets: stocks were sold to investors as bonds with price appreciation, and the larger and more stable the dividends, the better the stock was considered to be. Growth was viewed as icing on the cake. But does this policy make sense? After all, what differentiates debt from equity is that debt generates fixed (and contractual) claims on the cash flows, whereas equity gets whatever is left over (a residual claim). Companies that lock themselves into fixed dividends are in effect turning their equity into quasi bonds and taking away the primary benefit of using equity: its flexibility. Playing devil's advocate, though, there are two reasons given in defense of this established policy. The first is that it commits managers to returning cash to stockholders, who can then decide where to invest that cash. To the extent that you (as a stockholder) don't trust managers in companies to invest your cash, this is a good thing. The second is that dividends can be used as a signal by companies: firms with good growth prospects can increase dividends to indicate their confidence in future prospects. There are real costs to this policy, though. The first is that companies, fearing the consequences of cutting dividends, will be conservative about paying dividends, tending to set them well below cash flows. The second is that companies that get locked into unsustainable dividends will continue to do so and end up in much worse trouble. a. Dividends + Stock Buybacks: This is the policy that US companies have adopted for much of the last two decades. While buybacks provide more flexibility to companies, the downside is that they may give them too much flexibility to managers. Thus, managers who prefer to sit on large cash balances will continue to do so. b. Regular Dividends + Special Dividends: In countries where stock buybacks are either uncommon or restricted, companies supplement regular dividends (which are sticky) with special dividends in periods of high cash flows. In effect, these two choices preserve the "fixed dividend " policy and supplement it with additional cash returns. a. Fixed payout ratio: In much of Latin America, firms have sticky payout ratios (rather than sticky dividends). Thus, a firm will pay out 35% of its net income as dividends each period, resulting in dividends that vary with earnings. On the plus side, this allows firms to suspend dividends during periods of negative earnings, with little fanfare and signaling consequence. On the minus side, the problem with linking dividends to net income is that the earnings are not cash flows; a firm can have positive net income and negative cash flows, especially if it has significant reinvestment needs. b. Residual cash flow payout: A simple modification of the fixed payout ratio would be to tie dividends to residual cash flows, computed after reinvestment needs have been met. In fact, you can bring in net debt repayments that have to be made into this computation as well. In valuation terms, the dividend would then be set at a fixed percentage of the free cash flow to equity, with the percentage varying across companies. Thus, a company with stable and predictable cash flows may set dividends at 90% of free cash flow to equity, whereas one with uncertain cash flows and reinvestment needs may set it at 65% of free cash flow to equity. This approach preserves the commitment feature of conventional dividends without the inflexibility. c. Contingent Dividends: The earnings (and cash flows) at some companies are more a function of movements in a macro variable (say oil prices or interest rates) than firm-specific actions. Thus, an oil company will see its cash flows surge if oil prices hit $100 a barrel and drop off if they hit $ 40 a barrel. Rather than force this company to set a fixed dividend, which it may worry about sustaining if oil prices drop, dividends paid can be partially or fully tied to movements in oil prices. This allows the firm to pre-commit to returning cash flows to stockholders (as is the case with conventional dividends) without putting their financial health in jeopardy. Between 2001 and 2010, P&G paid out 41.65% of their net income in dividends. If you add in stock buybacks, they returned 110% of their earnings to stockholders and 120% of their cash flow to equity; they borrowed more money to fund their business. While the prudence of increasing leverage can be debated, that is not the purpose of this post. Instead, the chart notes the volatility in cash flows to stockholders created by the stock buyback policy (note in particular the jump in 2006). 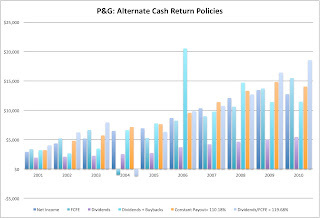 P&G could have returned the same aggregate cash flows to equity investors by paying a fixed payout ratio (110% of net income each year) or by returning 120% of their FCFE each year. Investors who are used to receiving a fixed dividend check in the mail will undoubtedly be disappointed. However, if your primary motivation in buying stock is earning a fixed dividend, would you not be better off buying a bond instead? Ironically, forcing companies to pay a fixed dollar dividend can result in fewer companies paying dividends and those that do paying less in dividends. Perhaps, it is time for a reset on dividend policy. The unemployment rate: A look at the sampling question. The unemployment numbers for the United States came out yesterday and they seemed internally inconsistent. Payrolls increased by only 36,000 (a significant disappointment, since payrolls need to increase by 200,000 or more to make a dent in unemployment) but the unemployment rate dropped from 9.4% to 9%. The news, though, gives me a chance to talk about one of my favorite topics: sampling, statistics and standard error. Staying on the unemployment numbers, it is worth examining how they are computed. The best source is the Bureau of Labor Statistics (BLS), which provides details on how it computes the numbers. What makes the unemployment numbers interesting is that the two numbers (payrolls and unemployment rate) are based upon different samples. As the BLS points out, it uses a sample of 60,000 households, translating into about 110,000 individuals, to estimate the number of employed and unemployed people in the nation and computes the rate based upon that sample. It uses interviewers to classify these individuals into three groups -those that are employed, those that are unemployed and those that are not part of the work force (they are not employed but are not looking for work either). Those who are not looking for work don't get counted. This a survey of 140,000 businesses, with roughly 440,000 work sites, with adjustments for new businesses starting up and businesses exiting. 1. Is the sample size large enough? Absolutely. As samples goes, these are both huge samples. To provide a contrast, the typical sample size for the polls that we see around presidential elections is 1000-2000. 2. Is there sampling bias? This is a concern with any test based upon a sample. If the sample is not representative of the population, the results cannot be generalized. Thus, if the sample of households used by the Labor department has a disproportionate number of college graduates or people from the Mountain States or people between the ages of 45-60, the results will be skewed. Unless I see evidence to the contrary, I will continue to believe that the Labor department has unbiased and competent statisticians on its staff to ensure that there is no sampling bias. 3. How much sampling noise is there? Even with a large sample size and no sampling bias, the results from a sample will have a standard error, i.e., a range on the estimated number. That standard error will be a function of the volatility in the underlying data. In periods like the last two and a half years, where the labor market has been in tumult, there is every reason to believe that the unemployment rate is being estimated with more error than it was in more stable time periods. There can be other sources for the noise as well. One culprit being pointed to is the weather, with some economists claiming that the terrible weather has affected employment statistics in some sectors (such as construction). This may explain the payroll data and the employed/unemployed numbers. Unless it also had an impact on data gathering as well, I don't see how this explains the surge in the number of people who have left the employment pool. 4. What post-sampling adjustments are being made to the number that may affect the reported number? The Labor department does not report the raw numbers that it gets from its survey. * It makes seasonal adjustments to reflect the "normal" ups and downs in employment. In December, for instance, it adjusts the employment rate to reflect the increase in part-time jobs before Christmas; thus, an increase of 100,000 jobs on the raw data might be seasonally adjusted to become an increase of only 20,000 jobs in the report. To the extent that the seasonal adjustments are incorrect or imprecise, they can cause the unemployment rate to be volatile. * The other number that the Labor department reports is revisions to previous months' estimates. Presumably, some of the respondents being interviewed provide information that leads to a reassessment of both employment data (into employed, unemployed and not in the work force) and payroll data in prior months. 5. Can I trust the results from the sample? Any estimate that comes from a sample has to be viewed as such: an estimate and not a fact. I believe that the employment picture is improving but it is doing so slowly. I would not be surprised to see the number of payroll jobs increase by a lot more in February but see the unemployment rate go up with it. 1. Check for bias in the source of the study. A study by a gun-control group that guns increase violence should be viewed with just as much skepticism as a study by the NRA that improving access to guns makes you safer. 2. Do not over react to any single statistic (or study). It may just reflect statistical noise. The problem will be magnified if you have small samples and are measuring a variable that is volatile or difficult to measure. 3. Look for confirmation in independent studies or assessments. With unemployment, for instance, the government does take multiple shots at getting it right. You have the unemployment claims that are estimated every Thursday, the payroll numbers and the unemployment rates. You also have estimates from private sources: ADP estimates the number of jobs created each month by private businesses and reports it just before the government reports the unemployment rate. I will feel more sanguine about US employment when I see all the numbers start moving in the same direction. 4. Statistical significance does not always equate to real world significance. There are a lot of findings that are statistically significant that matter very little in the real world. This is especially so with large sample studies, where small changes in a variable can be statistically significant. I know it is asking too much of reporters and researchers to be transparent: report sample sizes, standard errors and any information that may reflect your bias. On my part, I will try to do better on this dimension. However, as consumers, we need to be more skeptical about data and wary about generalizations. a. The dividend player: In the earliest days of equity markets, the advice given to investors was simple. Find a stock that pays a "big" dividend, and growth then is pure icing on the cake; the dividends will generate cash income while you hold the stock and the growth will provide for price appreciation. Over the decades, there are many investment strategies that have built around this premise, from the "Dow Dogs" (investing in the stocks with the highest dividend yields on the Dow 30) to more sophisticated variants. The academic research has been supportive, as I noted in an earlier post, with high dividend yield stocks generating excess returns, after adjusting for risk. At first sight, the shift to buybacks may seem like bad news for investors focused on dividends, but I think it actually strengthens their hand. 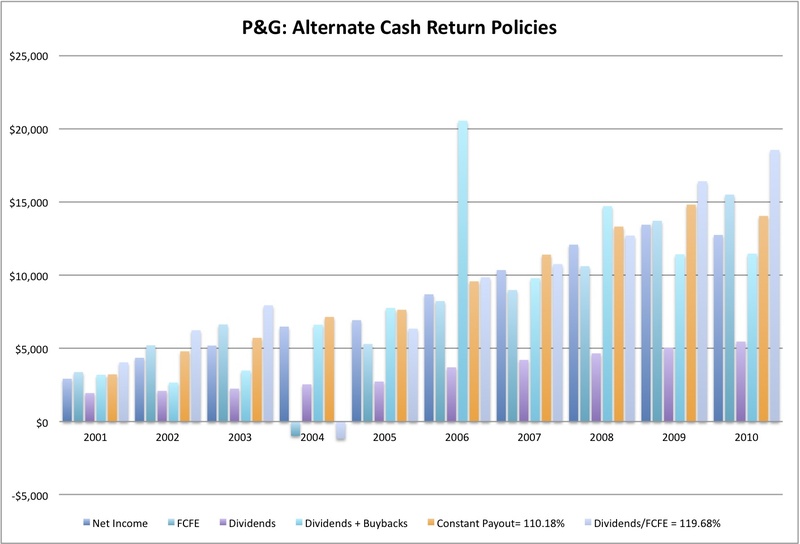 It is true that there are fewer "big" dividend payers than there used to be, but if you buy into the earnings stability argument (that the reason for the shift to buybacks is because companies feel less secure about future earnings), those big dividend payers who remain must feel even more confident about their future earnings potential than the dividend payers of the past. Put in more abstract terms, if increasing dividends was a positive signal in the past (when it was the only option for returning cash), it should be even more so now (when it would be far easier to just buy back stock). So, what are the caveats? First, the universe of stocks that you can invest in going to be smaller and there may be entire sectors (technology, for instance), where you will find few or no stocks to invest in. Second, watch out for the impostors. These are the companies with unstable earnings that have no business paying large dividends but do so because they want to take advantage of a large and loyal investor base that likes dividends. Bottom line: Focus on stocks that pay large dividends and treat buybacks as noise that you either weight very little or not at all in your investment decision. Screen for stocks that have the earnings to sustain dividends and offer some growth potential, and eliminate companies that have unsustainable dividends (they pay dividends with borrowed money or by selling assets). Since buybacks are volatile, you should use a normalized or average buyback per year, in computing the augmented dividend. While this strategy does widen the universe of stocks that you can invest in, it is also more risky than a pure dividend strategy. You cannot count on buybacks; in 2009, for instance, the dividends paid by US companies dropped by 10% in the aggregate but stock buybacks dropped by almost 80%. As I noted in an earlier post, there is a significant sub-section of companies that make themselves less valuable and perhaps even put themselves at risk of distress by buying back stock. Bottom line: Focus on companies that buy back stock for the right reasons - because they are under levered and have few investment opportunities. Stay away from over levered companies that buy back stock with even more borrowed money. c. The growth player: There are investors who have little interest or need for near term cash but are much more focused on long term growth and price appreciation. For these investors, buybacks are a mixed blessing. On the minus side, at some growth companies, the announcement of a buyback is a signal that the days of heady growth are over and that the company is approaching a more mature status. That would be a signal to sell. On the plus side, the use of buybacks may allow some mature companies to become growth investments. How? A growth investor who holds on to his shares will get price appreciation as other investors tender their shares. Bottom line: Look for mature companies where buybacks offer the most price appreciation potential. In general, these will be companies that are perceived to have few growth opportunities and have significant debt capacity. At growth companies, reassess prospects for the future on the announcement of a buyback. The price bounce after a buyback may offer the perfect exit strategy. No matter what type of investor you are, you need to be aware of when and how much companies are buying back. Unfortunately, both conventional print media (Wall Street Journal, Financial Times) and data services (Yahoo! Finance, Morningstar etc.) seem to pay little heed to buybacks. While it is possible to extract the raw data from the statement of cash flows, I think that adding an augmented dividend number would be a step in the right direction.